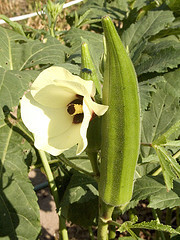 Okra loves heat but is sensitive to frost. Seeds should be sown directly in the garden 2 to 3 weeks after all danger of frost has passed. If well watered, seeds will germinate in 6 days, or up to 3 weeks. If you soak the seeds in water overnight they will germinate more quickly and evenly. Space the seeds 1 to 2 feet apart. The wider you space the plants, the bushier they will grow. This will increase your yield per row. The plants will begin flowering about 2 months after sowing, depending on variety. The pods should be harvested when they are about 2-4 inches long. If the pods get too old they will be tough. Old pods can be dried and used for crafts. The plants can grow up to 6 feet tall. They can keep producing until the frosts arrive. If your plants are getting too tall to harvest, or production is declining, you can prune the plants back and they will regrow. 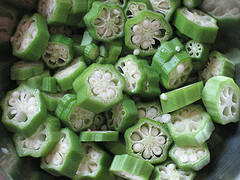 Okra has a delicate flavor. Many people enjoy it breaded and fried. It is a commonly used to thicken gumbos and stews. I once added sliced okra to canned cream of mushroom soup. Although I thought it tasted good, it looked unappetizing. My young son called it "booger stew". Okra makes excellent pickles. 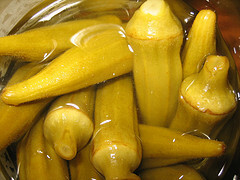 Click here for Lady Bird Johnson's recipe for pickled okra.